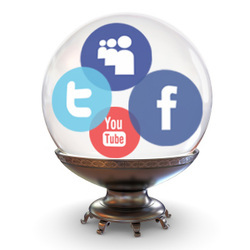 So what does the Future hold for the social media sphere? Well if there is one thing for sure, it’s that the social media space is going to get bigger. Our statistics and history analysis show that the number of people on these platforms has been growing at an exponential rate, and they are expected to continue to do so. Not only are the networks growing, but the amount and different types of platforms and technologies are expanding too. Services that were previously used for singular purposes are now expanding to try and get a slice of the social media pie. For instance, link shortening service Bitly recently launched a full redesign transforming its former link shrinking service into a new social network that aims to get people sharing and curating links, instead of just shrinking them. Instagram recently rolled out a new version of its service to Android users, so that it is no longer limited to iPhones. With additional technologies and tools being introduced every day, social media is going to become even more ubiquitous and ingrained in our every day lives than it already is. Well even though this expansion creates more and more opportunities for you to promote your brand, it does the same thing for everyone else. More people are jumping on the social media bandwagon and it’s becoming harder and harder to get noticed. It was a lot easier five years ago to make your Facebook page stand out when you were just one in under a 100 million users, but now you’re one of over 900 million. As social media technologies continue to proliferate, maintaining visibility on these platforms will get harder and harder and marketers will need to employ intelligent, creative strategies to win the attention they seek. It is also helpful to consider the future of specific platforms in determining where the future of social media marketing lies. Recent popularity with new platforms Instagram and Pinterest suggest a user preference towards visual materials. Facebook has followed this trend, introducing it’s most recent Timeline redesign to place more emphasis on images and video rather than text. Should this trend continue to progress it would be wise for marketers to make use of a lot of visual materials within their campaigns. Financial and economic factors can also play a part in determining the future of certain social media platforms. It should be noted that even though Facebook is currently by far the most popular social media platform, there has been a great deal of speculation about the future of the social media giant. Facebook’s recent flotation on the stock market coincides with the introduction of a number of new features that look to monetise the platform. This includes a handful of new advertising opportunities that aren’t just placed to the side of the News Feed, but also within and above it. The company is also looking to now make money not just from advertisers but also from its users by trialling a new “Highlighted Posts” feature that allows users to pay two dollars to have their posts promoted to the top of the News Feed. The introduction of these new features suggests a departure from Facebook’s previously free and fair community-based framework towards one that’s based on insidious advertisements that don’t enhance the user’s experience but instead interrupt it. If Facebook continues down this path it is likely that it will lose a large number of its users and it will become harder and harder to create genuine relationships with target groups on Facebook. Hence, marketers will need to look at moving to different platforms to do so. Whether this will eventuate, only time will tell.